Things began going wrong for the cassowaries of Far North Queensland as far back as the 1980s. Long-time Mission Beach local Liz Gallie says the problem was obvious: large numbers of tree-changers began moving in to the wet tropics area and developing the land running north and south of Cairns. With their arrival the character of the region began to irrevocably change. Gallie tells me she has spent the past 30 years “watching as the threats to the cassowaries’ existence have increased without being addressed”. “We watched as block after block of land was bulldozed as waves of economic booms attracted developers,” she says. Much of this clearing affected remnant forests that were large areas of cassowary habitat. These changes have meant the remaining cassowaries have to cross roads and residential areas in order to access their essential food habitats. Pockets of the World Heritage rainforest now sit directly alongside residential areas. For Russell Constable, who moved to northern Queensland from the Gold Coast in the mid-1990s, the plight of the flightless species became apparent in a more shocking way. One day shortly after he’d relocated north, he and a pig hunter were hiking in the wet tropics when they stumbled upon a one-and-a-half-metre tall bird wandering alone in the forest. Constable’s companion immediately pulled out a .22 Magnum rifle and shot the cassowary dead at close range. The now 49-year-old conservationist never again kept the company of pig hunters, instead vowing to protect the endangered species. Constable, who lives on a 40-hectare block at Bramston Beach, 60 kilometres south of Cairns, says cassowaries “used to come on our property and swim in our dam, but those days are gone now”. With this year’s number of fatalities already equalling the total for 2014, the increase is dramatic and concerning. Local observers also warn that these official figures represent only a small fraction of actual deaths, as many go unreported. The first interaction between cassowaries and early colonialists was recorded by William Carron, a botanist on the ill-fated Kennedy expedition from Rockingham Bay to Cape York in 1849. To the local Djiru traditional owners, the gunduy (as they call the cassowary) was traditionally an important source of food. “Still to this day, the gunduy holds great significance to rainforest Aboriginal peoples,” Djiru spokeswoman Rona Hart tells The Saturday Paper. The Djiru people have identified the three major threats to the cassowary: continual habitat loss, vehicle strikes and dog attacks. Hart says the traditional owners in the area wish to implement a cassowary management strategy for Mission Beach that addresses these concerns. “Culturally assured scientific research is a priority to arrest the extinction of the gunduy, whose survival is critical to the health of rainforest country across wet tropics,” she says. As one of Australia’s few specialist frugivorous species, these giant birds (the females can reach two metres in height and weigh up to 74 kilograms) feed on up to five kilograms of fruit a day and are dependent on closed tropical forests to survive. They also play an important role in the maintenance of tropical forests as dispersers of seed. But there have long been valid conservation concerns for Casuarius casuarius. According to a 2014 CSIRO report that provided a region-wide re-census of cassowary populations in the wet tropics based on earlier surveys conducted in the 1990s, the number of remaining cassowaries is estimated to be just 4381. These northern Queensland populations are spread from Mission Beach in the south to Cape Tribulation in the north, with a large gap separating a population in Cape York. The report concludes: “Our estimation of 4381 cassowaries in the wet tropics region indicates this is a species that is still of conservation concern and which must remain a focus of management.” Research has barely begun on the Cape York population. On top of climatic disturbances such as Cyclone Larry, which destroyed much of the cassowary’s territory in 2006, the creatures are now getting regularly killed on the roads around Mission and Bramston beaches by the vehicles of tree-changers and nature lovers. They are also regularly attacked by unsupervised domestic dogs. Liz Gallie is the president of Mission Beach Cassowaries and says her fascination with cassowaries grew out of observing them in their natural habitat over three decades. She says overdevelopment of the bird’s natural habitat, new roads and increased traffic, and a growing number of dogs in the area have led to many cassowary fatalities. The irony of places such as Mission Beach, says Gallie, is that people are attracted to the region, which is a meeting point of two World Heritage areas, because they might get to see cassowaries in the wild. But these people inadvertently prove to be the biggest threat facing the birds. To make matters worse, current planning schemes are geared towards the area becoming a resort, marina and high-rise tourism destination. “The current planning scheme would allow Mission Beach’s population to reach 18,000, which is incompatible with the survival of the cassowary. Development is still seen by the local authorities and tourism organisations as the economic driver and is encouraged. It is an oxymoron,” she says. Gallie and other local activists have taken matters into her own hands in Mission Beach by getting schoolchildren involved in making signs for the local roads featuring images of cassowaries with messages such as “We live here too!” They also monitor cassowary sightings, injuries and deaths via a dedicated Facebook page. “At Mission Beach, 40 per cent of cassowary habitat is still not protected,” says Gallie. “Without leadership from the local authorities, a culture of complacency and acceptance will continue. We are taxing the species with our dogs and on our roads at an unsustainable rate. The community has demonstrated the will to protect the cassowary. Now we urgently need the local, state and federal governments to do the same. That is the only hope for the future of the cassowary,” she says. 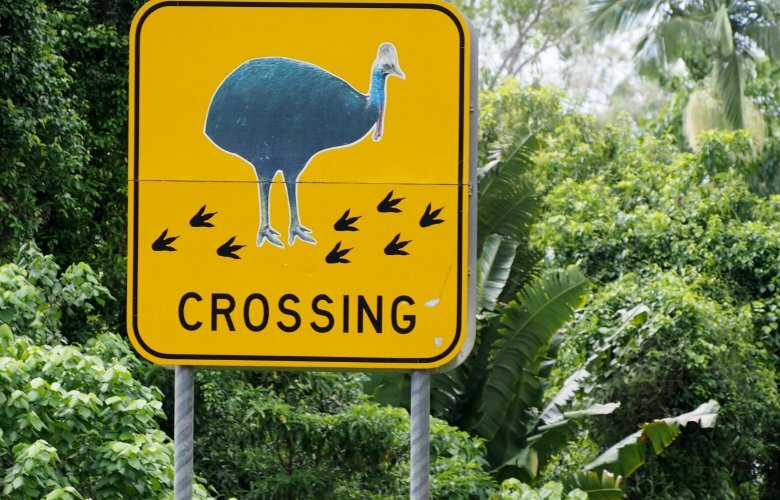 But according to Cassowary Coast Mayor Bill Shannon, the council has already taken steps to ensure the cassowaries are protected, including controversially reducing speed limits to 80km/h. “Mission Beach is a community divided on this issue,” he says. “Council has done many things, including installing traffic pacifying devices and erecting signs in and out of the town. I’m certainly not convinced the cassowaries are endangered in our area. I’ve seen three today on my property. But we absolutely support the protection of the future of the cassowaries. I certainly don’t want to be the mayor of the ‘Extinction Coast’,” he says.